Headings are section titles in your research paper. 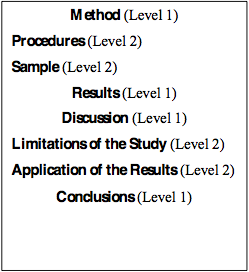 In APA, you can have up to 5 levels of headings. Every heading level must contain at least two listings; otherwise, incorporate the material into the heading above that level. In other words, you cannot have just one subheading under “Findings”; you must have at least two. 1 Centered, boldface, first letter in Uppercase. 2 Flush left, boldface, first letter in Uppercase. 3 Indented, boldface, begin with first letter in Uppercase and end the title with a period. Text continues on the same line. 4 Indented, boldface, italicized, begin with first letter in Uppercase and end the title with a period. Text continues on the same line. 5 Indented, italicized, begin with first letter in Uppercase and end the title with a period. Text continues on the same line. my question is this, is the cover page comes before the title page? or title page before the cover page? 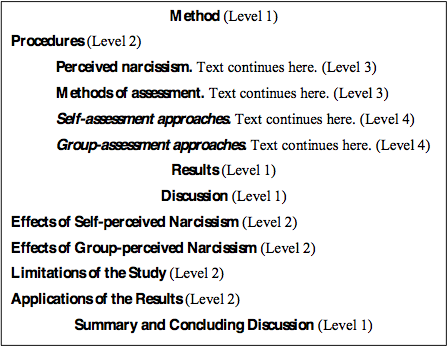 I like the way you have presented the differences in the levels of headings for APA, especially the clarification of what “paragraph heading” means. 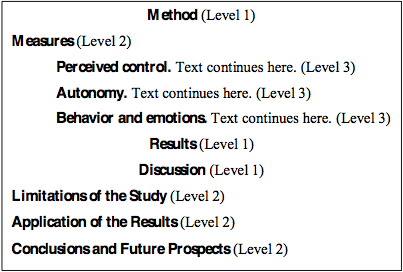 The one concern I have is that for Levels 1 and 2, it states “First letter in Uppercase.” Although the examples clarify this, if individuals look only at the Format section, they may interpret this as meaing you would only capitalize the first word of the heading at for Level 1 and 2 headings (which is true of the other levels). In fact, at Levels 1 and 2, use title case and conform to the guidelines for capitalization found in section 4.15 in the APA Manual. You may want to clarify this. Great resource!